My last post was about Vermeer’s exquisite “Woman in Blue Reading a Letter,” which I saw last month in Amsterdam’s Rijksmuseum. I bought a much more humble painting for my own wall, in an antique shop in Santa Monica. Like many old forgotten oil paintings, this one leaned against a wall with others stacked against it; in fact, there was a dent in the canvas, which smoothed out once I rescued it and brought it home. There was some water damage along the bottom edge. Still, the colors were brilliant. It’s one of my very favorite pieces. It’s about 2 by 3 feet, much larger than Vermeer’s. I don’t know who the artist was. 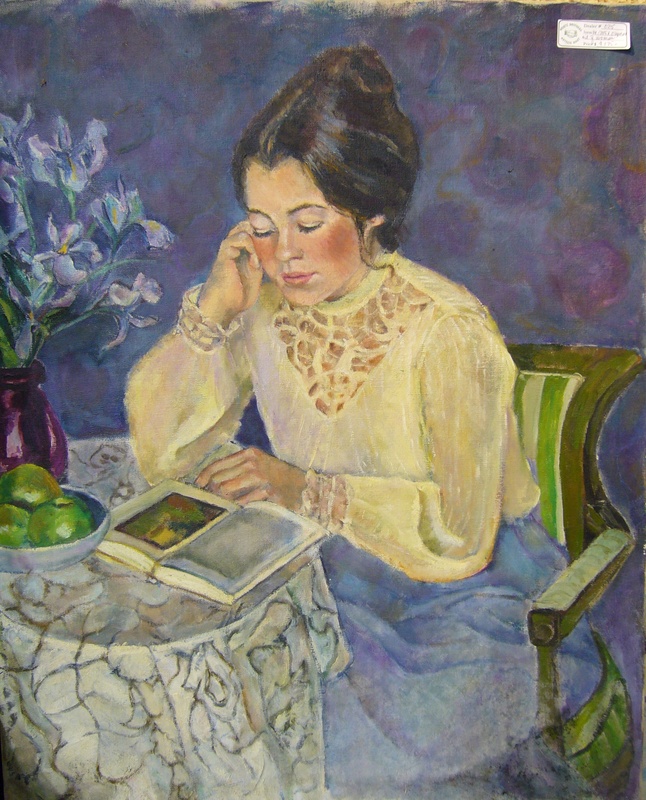 But the subject speaks to me: a woman seated in a lovely, peaceful room, absorbed in her book. For many centuries, all over the world, women were discouraged from reading. In places in our contemporary world, reading is still discouraged or even forbidden to women. A woman reading is a woman not cooking, cleaning, weaving or tending a garden. Worse yet, a woman reading might get uppity ideas about her place in the world. Who knows what might come of a woman quietly reading, all by herself? 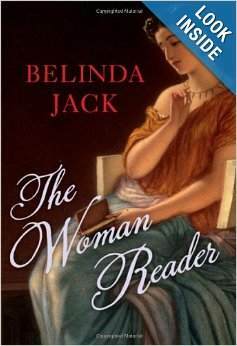 A British writer, Belinda Jack, has written a book titled The Woman Reader. In it, she explores the history of women reading, in much the same way Virginia Woolf explored the history of women writing in her book A Room of One’s Own. In many ways, a woman reading a book is creating her own private room, her own space within whatever world she lives in. This interior space, created anew with each new book opened, is really a window onto the wider world outside. We can experience absolutely any time or place, real or imagined, when we pick up a book. We can learn new skills and new ways of looking at life. We can learn from those who have gone before us. I was fortunate in having parents who especially encouraged me to read, took me to the library, and gave me the quiet time to develop a lifelong love of books. I wish that good fortune for all children, especially girls. A review of Belinda Jack’s book, by Hermione Lee, is at http://www.theguardian.com/books/2012/jul/05/woman-reader-belinda-jack-review. This entry was posted in Amsterdam, Art, Netherlands and tagged "A Room of One's Own", "The Woman Reader", "Woman in Blue Reading a Letter", Amsterdam Rijksmuseum, Belinda Jack, Hermione Lee, history of women reading, paintings from Dutch Golden Age, Vermeer, Virginia Woolf, Women discouraged from reading on October 30, 2013 by Claudia Suzan Carley.